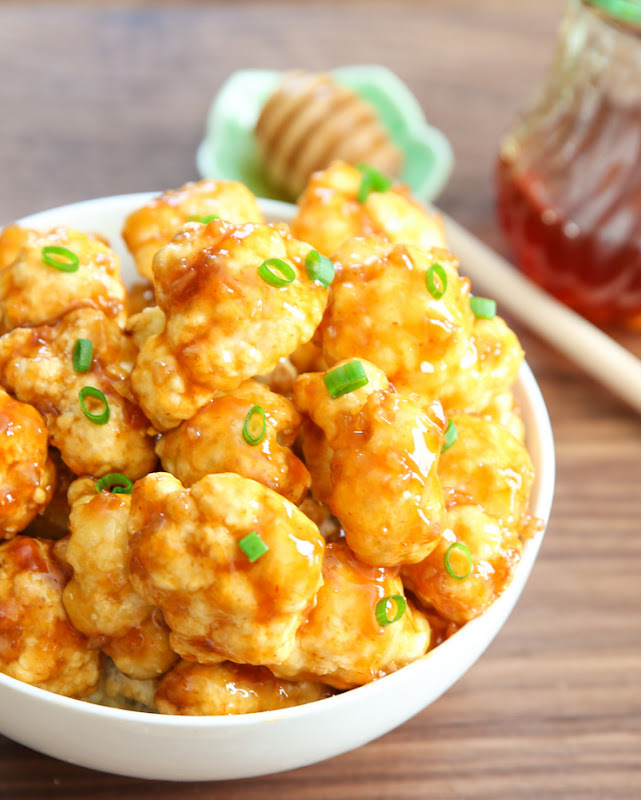 Roasted cauliflower is kicked up a notch with the addition of this addicting honey garlic sauce. The other day, Mr. K told me he preferred eating cauliflower over chicken. This can only mean one of three things. 1. I’ve finally won him over with all my cauliflower creations. 2. He’s been abducted by aliens and no longer himself. 3. My chicken recipes are that bad. I’d like to think it’s the first one. I’ve had a lot of fun with my cauliflower creations, but honestly, my favorite way to eat it is just simply roasted with some seasoning. Recently, I decided to top it with one of my favorite sauces, my honey garlic sauce. I adore this sauce with crispy chicken and it works just as well on roasted cauliflower. By the way, if you do like chicken, you can check out my honey garlic chicken. 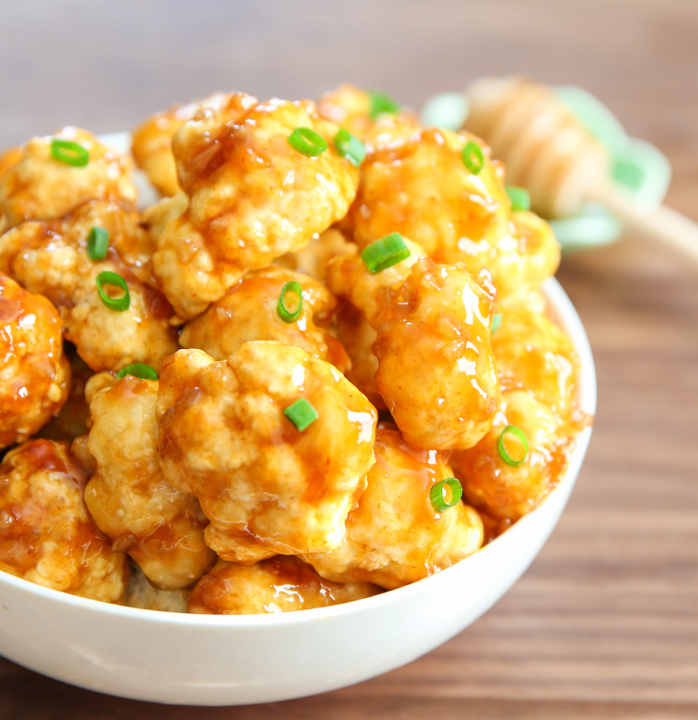 Roasted cauliflower coated in a savory-sweet honey garlic sauce is a quick 30-minute appetizer or main dish. Preheat oven to 400°F. Line a large baking sheet with parchment paper. Place cauliflower florets on a baking sheet. Roast for about 15-20 minutes or until cauliflower is cooked and tender but still a little crisp. Allow cauliflower to cool for a few minutes (about 10 minutes). While the cauliflower is cooking, make sauce on the stove. Add all sauce ingredients except the cornstarch + water. Bring to a low boil and stir until blended. In a small bowl, completely dissolve cornstarch in water, then add to the mixture. Stir until sauce boils again and cook until sauce thickens (about 2 minutes). Set sauce aside and allow to cool for a few minutes (it should still be quite warm, but not so hot as to burn your skin if you were to touch it). Sauce will thicken even more when cooling down. When cauliflower has cooled down enough that you can touch them without burning yourself, add them to a large bowl. 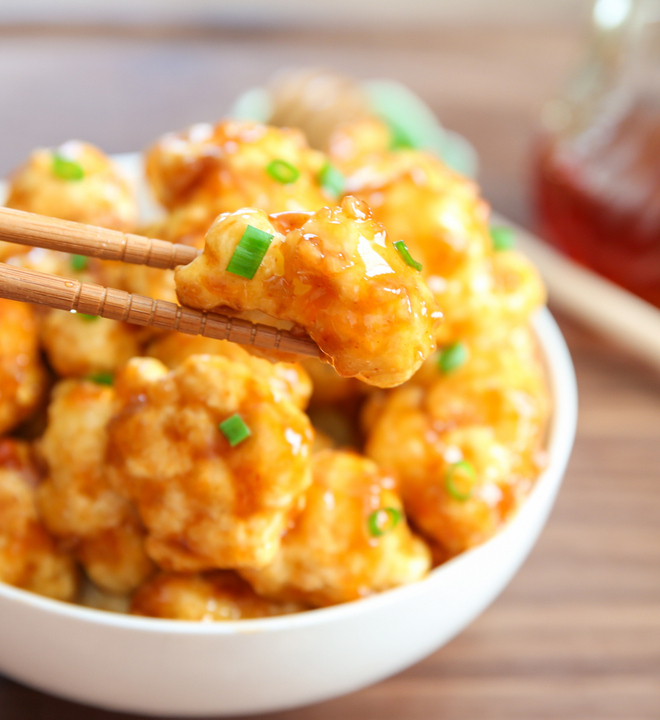 Pour in sauce and toss cauliflower in sauce and coat. 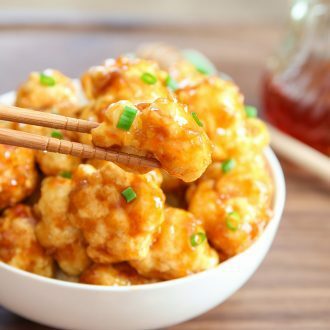 Please allow cauliflower to cool down slightly before tossing in sauce, otherwise if they are too hot, it will thin out your sauce considerably. Serve while still warm. Garnish with fresh scallions if desired. I wouldn’t be able to stop eating this, looks incredible! Wow, this looks amazing! I can’t wait to try out the recipe. Thanks for sharing! This looks delicious! Alas, my family isn’t keen on sriracha sauce. Is it a problem if I leave it out/substitute with powdered cayenne pepper or chili pepper? yes you can leave the sriracha out. Recipe is too sweet. Also after i mixed the thickened sauce in, let it stand for a while, it turned back into a watery substance. Any particular reason the cornstarch isn’t listed as “2tsp”? Half of a tablespoon is 1.5 teaspoons + .5 teaspoon…..I wasn’t sure if maybe some of it is used other than being dissolved in the water? Normally I do have a good reason, but in this case, you are totally right and I’m changing it. Honestly it was because when I was fiddling with this recipe I first did 1/2 tbsp and found the sauce wasn’t thick enough and then added 1/2 tsp and ended up just writing it that way instead of converting it to 2 tsp. Thanks for noticing! 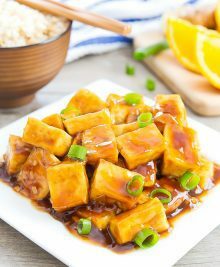 I am vegan and love looking for new recipes this looks amazing!.. i wonder if I could use maple syrup instead of honey? the change would be slightly altered, but it should work fine! I just tried this recipe today. It is incredible! I will use this sauce with chicken as well, amazing! so glad you liked it! I originally used it for chicken, then the cauliflower. it’s just so addicting! Just prepared your recipe. Waiting for the cauliflower to bake. What’s your best way to heat? Just wondering in case there are leftovers. I actually haven’t had leftovers before! we always eat it as soon as the photos are done. sorry! i love that sauce smell too! i agree. unfortunately I will not be cooking this recipe again. it came out way too watery. the longer it sits in the sauce…the more soggy it gets. 2 minute’s wasn’t enough time to get the sauce to thicken. It took about 5-10 minutes on med high for me on an open fire. Thankfully I added the scallions because it balances out the fact that it’s too sweet like Natalie mentioned in the above comments. Although I made this dish using the step by step directions above, but sadly, this did not come out good for me. sorry you didn’t like it. this is one of my most popular recipes and I just made it last night with no issue. If the sauce is too sweet you can always add more soy sauce. Also, did you add the cornstarch because the sauce should not turn watery if you add cornstarch to it. Also you mentioned cooking on an open fire. I havent had much experience with that, but I imagine the heat won’t be quite the same as stovetop, which is maybe why it took longer? Can you do it with chicken instead of cauliflower? Well I’m in agreement it is a bit too sweet, I’m wondering if you salt and pepper the cauliflower before baking, it seems like that would help. Maybe it’s just too sweet for my taste. I also noticed that the sauce got watery as well, maybe that has something to do with not salting the cauliflower as well. Not criticizing just giving an honest impression, I ended up adding some chicken bullion to temper the sweet. Thank you for sharing at any rate, love trying new things even if it doesn’t turn out the way I want it. Made this tonight and it was excellent, didn’t have any of the issues some of the other reviewers had. I remember when I started making thick sauces sometimes I had trouble and it was because I didn’t let it come to a boil/cook long enough, I would bet that is probably the issue because mine is very thick. thank you for sharing! So glad you enjoyed it! I made this for the first time tonight and really loved the flavor, but I had the watery issue too! I boiled it down in the saucepan until it was thick enough to start leaving trails on the back of the spoon, then coated my cauliflower fresh out of the roaster. I’m a baker rather than a chef, but perhaps the cauliflower was still too moist and let a lot of water off when the hot sauce hit it? I did you frozen cauliflower – thawed (mostly) and squeezed dry before roasting until the edges browned. Or is it a reaction from the hot cauliflower hitting the sauce and getting it runny? Oh sorry to hear about your sauce! The sauce turned runny because of heat. I’m about to add further instructions so others don’t have this issue, but you should wait a few minutes for your cauliflower to cool down before you toss and coat. You mentioned that you coated right away which is what likely caused the sauce to turn runny. If you allow the cauliflower to cool down slightly, and then remove it from a pan and put it into a bowl and then coat and toss, your sauce should remain thick. Hope this helps! Thank you for the recipe. I was wondering if this dish can be made ahead of time, frozen and then reheated? I’m having a little get together and would like to prepare mostly everything before guests arrive. I’m not quite sure. I haven’t tried freezing it before and I don’t know if the sauce will get too clumpy once it’s frozen. I used agave since we are vegan, and thickened the sauce a little with corn starch. Amazing! One of my new favorites! Hi this recipe sounds yummy. I was wondering if you have the nutritional info on it. I also love the idea of using the sauce on chicken. I do not. But there are websites out there where you can calculate nutritional information for a recipe. Hiya first of all thanks for posting this recipe. It really didn’t work for me though. I used half a cauliflower which turned out to be far too little. I easily could have used a full one; there was a LOT of sauce relative to it. Sadly I ended up throwing the meal away because it was very strongly flavoured and kinda soggy. Never mind! But it’s a shame I used so much of my pricey honey. Hi Georgia. I’m sorry to hear about your difficulties with this recipe. For the cauliflower, 1/2 head was referring to 1/2 of a large head. if you have just a small cauliflower, definitely use the whole thing. You mentioned having a lot of sauce, but also your sauce didn’t thicken properly. If the sauce thickens, it definitely becomes a smaller amount. For the sauce color, the soy sauce makes a big difference. Dark soy sauce will really mute the color and make anything look really dark. I always try to use light soy sauce for a more golden color. Also the sriracha brings out the orange tone so that the color is not as brown. With regards to it not thickening, I’m not quite sure why that is happening. Did you allow it to sit and cool for a little after? Because the sauce should start thickening while it’s simmering, but when it starts cooling it should thicken about twice as much. Some things to keep in mind: make sure to keep it at a simmer because if it cooks at too high heat it won’t thicken properly. Also, while you want to stir to keep it from burning, you don’t want to stir so much that it never bubbles. Too much stirring will release too much heat and you will need a lot longer time for the sauce to thicken. If all else fails, you can add more cornstarch which is what is thickening the sauce, so you can try adding in 1/2 to 1 tsp more. Hope this helps! OMG…! Cauliflower has always scared me a bit, but I just made this for dinner and I love it so much!! Thank you for this utterly delicious recipe!???????? oh yay!! so glad you liked it! I made this tonight, doubled the sauce and added shrimp as well. This is a winner, and we will be outtingnthis heavenly sauce on everything! My husband actually ate the cauliflower, which he usually hates. This recipe looked so good to me! Unfortunately, it looked NOTHING like the picture… It was a much darker brown. Unlike the other reviews, my sauce was way too thick. I made it exactly as the recipe stayed. I may or may not try this again. The flavor was great, just too thick for us. the darker brown is likely the soy sauce you used. I use a low sodium light colored soy sauce which produces a more light and golden brown when mixed with the honey. The sriracha also adds to the color. With regard to it being too thick, you could reduce the amount of cornstarch and that should keep it from being too thick. I’m not quite sure why yours came out super thick. After reading the reviews and seeing that some thought the recipe was a little too sweet, I decided to use 4tbs honey instead of 6. I also did not have cornstarch so I used flour (4tsp) and mixed it with water. The sauce turned out very tasty with a nice thick consistency! Yum! Just finished eating this and had to thank you. Thank you! I’ll definitely be making this again. awww, so glad you liked it so much! Like most others, I found the recipe too sweet for my liking when I made the recipe the first time.. I made it again the next night, only used 4 tablespoons of honey and used 3 tablespoons of soy sauce. It balanced it out perfectly in my opinion. The sauce was thick and smooth as well, had no problems with it going watery. I’m glad you got the sauce to work for you. Everyone has different taste preferences. please use a website like verywell.com to calculate nutrition analysis you need. 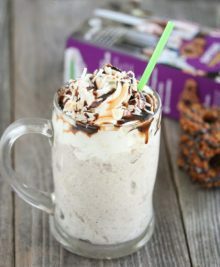 This looks so delicious, I can’t wait to try it! 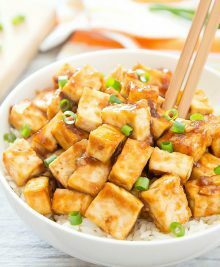 I just have one question about the sauce: is the sriracha and the soy sauce supposed to be put into the mixture for the sauce or is it meant to be on the side to dip in? Thank you! Apologies for any confusion. 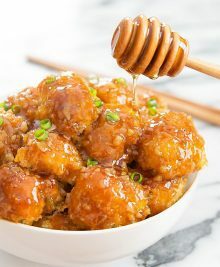 The soy sauce and sriracha are part of the sauce ingredients that need to be added into the honey garlic sauce mixture.